DYNASET PPL Hydraulic Pipe Cleaning Unit converts the hydraulic power of a mobile machine into high pressure water for pipe cleaning. It is a great unit for cleaning and flushing pipes, sewers, underdrain or removing ice. 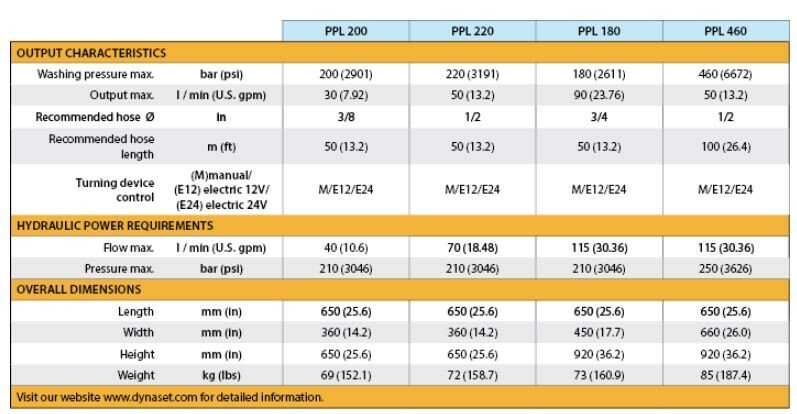 PPL systems come with different sizes and pump combinations. Effective flushing and cleaning length is up to 100 m in horizontal use and 20 m in vertical direction. Water pressure reaching up to 460 bar and flow up to 90 l/min depending on the model. It is made for professional, having robust construction, adjustable water pressure and availability for remote control, water heating unit, hose reel and water pistol. PPL is compact unit that fits large variety of vehicles such as vans, trucks and service vehicles. Installation requires only the placement of the PPL unit, connections to the mobile machine’s hydraulics and to the water source. The additional hose reel and water pistol can also be included for any power washing application. PPL unit can also be equipped with a water heating unit WHU, if hot water is needed for the job. HOW DOES THE DYNASET PPL HIGH PRESSURE PIPE CLEANING UNIT WORK? 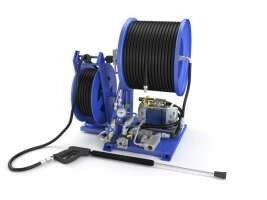 PPL Hydraulic Pipe Cleaning Unit produces high pressure pipe cleaning power using the base machine’s hydraulic system. When the hose of the PPL is inserted to the pipe, the hydraulic flow can be turned on to the PPLs pump. Water is then pumped to the hose and water jets from the nozzle push it through, flushing and cleaning the pipe. After use the PPL’s hose can be hydraulically rewound back to the hose reel.With the additional remote control user can operate the main functions of the PPL remotely. Installing the PPL to a mobile machine increases the machines versatility and utilization rate. Compact all-in-one structure takes minimal floor space, fitting it even in a small van leaving space for other uses. No longer big machinery is needed for pipe flushing jobs. PPL is easy to install and use. It can even be operated remotely. Different kind of nozzles for cleaning pipes, removing ice from the pipelines or root cutting from underdrains. Also the additional hose reel gives the possibility to have power washer at hand when needed.